The yellow '02 Cobb tuned wrx had 10 inch wide tires. It also had a some special wide body finders on it. Whenever I would see it in the mags, I had to grab a barf bag -- cuz it was sick. It had reported lateral g ability in excess of 1 (i.e., it would not slide off your bathroom wall -- unlike some other things you body produces). But that did not stop it from wipe-out during a mag foto shoot. See some back issue of import tuner. any pics from the rear?!? Are you tucking the rear wheel? And do you have lateral links? Assuming your actually wanting to run a 9" wide wheel, what suspension setup are you using? If you're stock, DON"T DO IT as even rolling the fenders will still cause rubbing issues. Now, if you're on coils, be sure you're on a stiff enough spring before attempting or else you'll need to bump up your spring rate. I thought about a widebody but thats just out of my budget right now. In a year probably gonna do it. Im actually gonna run 9.5" wide rim. Im not stock either. Tein Flexs, camber plates, F/R laterral links. Digitalseance; Have you done this or are you speculating? What are the flex's rates? Those rates should be fine unless you're using r-compounds or have 5 people in the car and corner hard I would think. Good luck, I'd like to see the outcome of yours as well! Mine is strictly for autocross, the car is now being trailored so....I don't have to worry about those kinds of things. What did you ever put on your car? What package did you end up with? btw, those who got their fenders rolled, where can i get it done in the east/south bay? and how much did it cost for just both the rears. 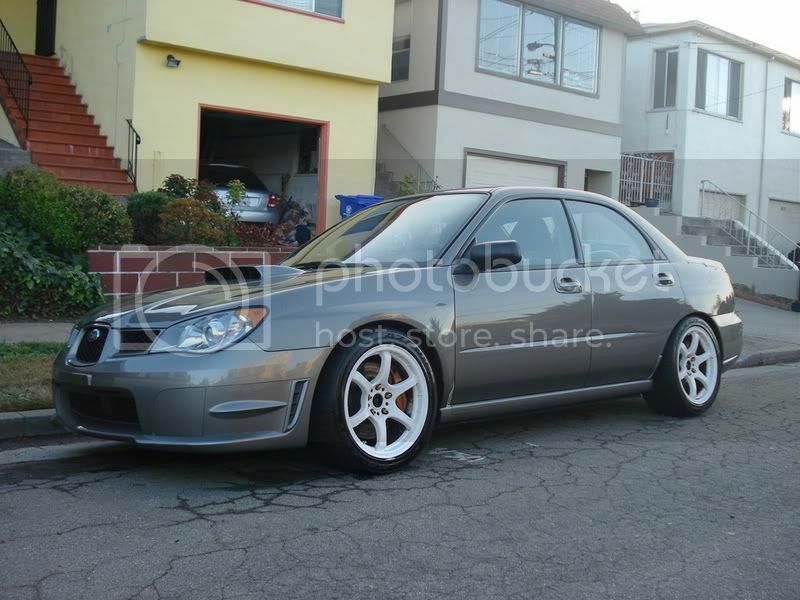 Quick Reply: 18x9" wheels on an 02 wrx? ?